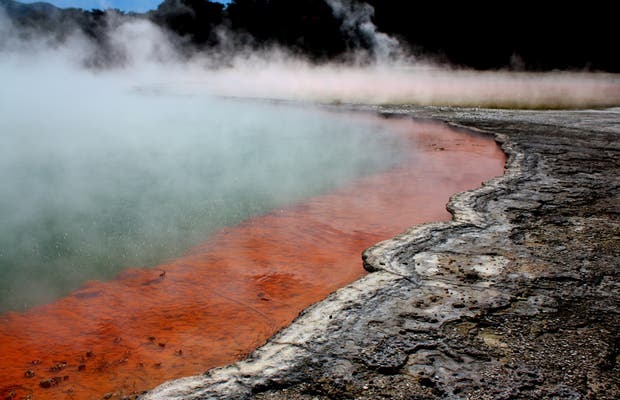 We went to Waiotapu, 25 km from Rotorua (NZ $ 23 / person, a 3 km, 2 hours). Here there is a gymkhana between demonic craters of vapors and odors emanating of sulfur and other minerals. There are bubbles because of the CO2 levels. The water reaches the center of the earth at 230 ° C and once it reaches the surface the temperature cools to 70 ° C. There are boiling mud pools and some highlights of this place is the "champagne pool" and the Lady Knox.